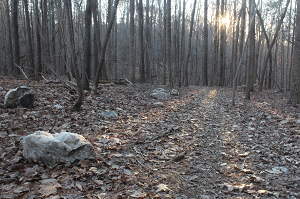 More than twenty miles of hiking trails provide access to most of William B. Umstead State Park. 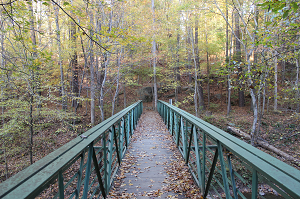 Visitors may choose between a short stroll along a nature trail or a more extensive hike into the woods. Either choice will be rewarding as the beauty and diversity of the park's natural resources are best seen from any one of its many trails. 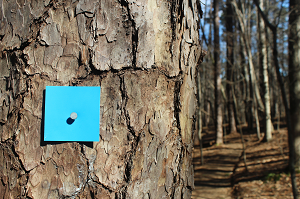 Some of the trails at the park interconnect; to avoid becoming lost, pay close attention to trail markers. No bikes or horses are allowed on hiking trails. For people who prefer horseback or bicycling, approximately 13 miles of multiuse trails travel through some of the most scenic and secluded parts of the park. Horses and bikes are restricted to the multiuse trails and are not permitted in other areas of the park, including hiking trails. Multiuse parking is available on Sycamore Road past Maple Hill Lodge. All visitors with horses must be able to provide proof of a negative equine infectious anemia (Coggins) test while visiting North Carolina State Parks. 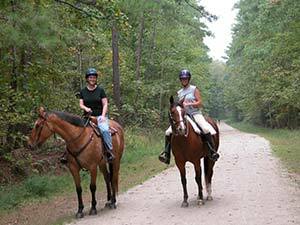 All equestrians must check in at the Visitor Center, which is located off Highway 70/Glenwood Avenue, prior to riding on the multiuse trails. Company Mill Trail begins with the one mile spur to Crabtree Creek and the site of Company Mill. After crossing the bridge, the spur connects to the loop. Scenic areas along the trail include the banks of Crabtree and Sycamore Creek. Signs of an additional mill, Lynn Mill, can be found along Sycamore Creek. A short loop that connects to Company Mill Trail. A section of the trail follows a small stream to the south. To the north, the trail offers views into the slopes along Crabtree Creek with dense thickets of mountain laurel. Benches are available along the route and several species of trees are identified with interpretive signs. Location: Back righthand corner of the Reedy Creek Entrance parking lot. This out and back trail crosses Reedy Creek and continues to the park boundary. 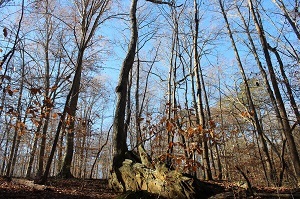 For those looking to venture farther, the trail connects to Schenck Forest. Options for loops are available at intersections with the park’s multi-use trail at Reedy Creek Trail and South Turkey Creek Trail. Trace along a route through local history. Much of the park’s multi-use trail was at one time roads that connected a small farming community. There are several options for accessing the trail with the main trailhead located at the end of Sycamore Road. Reedy Creek Trail connects to the Cary and Raleigh greenway systems. Location: Small Parking lot at Crabtree Creek Picnic Area. A short loop includes the feature for which the trail is named as a highlight. The trail crosses a small stream, Sal’s Branch, at two points along the route. Stonework including a check dam and culvert are signs of early projects to restore the land and build a park. This is also the park’s TRACK Trail.